Germany's Deutsche Post (XTER:DPWA) has been the market share leader of couriers and local delivery service providers globally. The company's exposure to Europe made its stock price susceptible to market whims, especially with the already recorded slowdown in major economies outside the U.S. Warning! GuruFocus has detected 2 Warning Signs with RCG. Click here to check it out. Deutsche Post derived more than 60% of its business revenue from Europe in 2017 and is due to report its 2018 numbers on March 7. In its recent quarter, Deutsche Post performed in-line with its expectations and recorded 0.68% growth in its Europe operations. Its Germany operations, however, declined by 0.09% year-over-year, which coincided with the GDP slowdown in Europe's largest economy in the same quarter. Known for its DHL brand name globally, Deutsche Post derived 30.4% of its business revenue in Germany in 2017. The market also may have punished Deutsche Post's shares upon learning that FedEx (FDX), a leading global competitor, had to cut its earnings forecast for 2019, citing deceleration in global trade, underscoring Germany's GDP contraction, the uncertainties in Brexit and other concerns. Down 40.5% for the past year, Deutsche Post's ADR shares are trading at a trailing earnings multiple of 12.7x compared to its three-year average of 15.3x. This is still more expensive than FedEx's 9.6x but cheaper than UPS's 16.2x. In comparison to its peers, Deutsche Post also carried a leveraged balance sheet in its recent report, with a 1.48x debt-equity ratio compared to 1.5x a year ago. Further, the application of new accounting standards at the start of 2018 caused Deutsche Post to record a negative EUR248 million free cash flow compared to EUR457 a year ago. This may have turned away more investors. Despite the palpable fears of the global slowdown this year, analysts project a near 27% jump in earnings for Deutsche Post this fiscal year on top of a 6% decline in its yet-to-be-reported 2018 estimated earnings numbers. 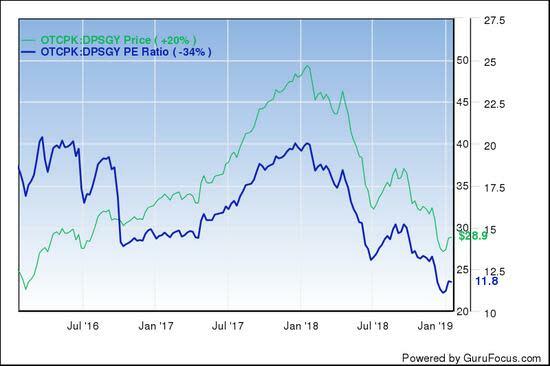 Pundits also place an overweight recommendation on the ADR shares with a price target of $40.62 per share compared to $29.53 at the time of writing. Knowing the limitless possibilities of global growth and geopolitical issues, buying Deutsche Post at this point may still be too early. Should the company in the fourth quarter exhibit some form of resistance to the ongoing slowdown fears remains to be seen. Meanwhile, an earnings multiples comparison has indicated that FedEx is far cheaper.